Home » Out-of-place artefacts » Anomalously old technology » Egyptian ‘aeroplane’ models? 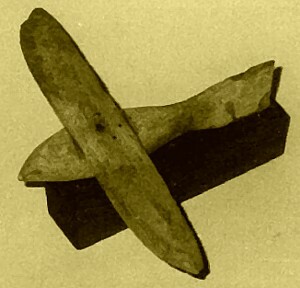 In 1898, a curious winged wooden object is said to have been found at Saqqara by a French Egyptologist named Lauret in a tomb belonging to one Padiamun, dating from about 200 BCE. When the artefact was sent to the Cairo Museum, it was catalogued (number 6347) and then shelved among other items classed as bird figurines. In 1969, Dr Khalil Messiha (1924-1998), an Egyptian doctor with an interest in model aeroplanes, visiting the Egyptian Museum in Cairo, saw the figurine in its display case and was intrigued by its characteristics. He felt that it showed features never found on birds, but which are part of modern aircraft design: it has no legs, its tail and wings are straight and the tail is vertical. Part of the tail is broken, and Dr Messiha thought that a stabiliser might have been attached there. The tail slants slightly towards the right when looked at from behind. The model is made from a light sycamore wood, weighs 39.1 g and its wingspan is 180 mm, while the body is 140 mm long. Dr Messiha made a balsa replica, which flew when he added the assumed missing stabiliser to the tail. He thought that the clearly aerodynamic design of the object, together with its ability to fly, indicated that it was a model of a genuine aircraft, perhaps a glider of some kind, that might have travelled at up to 50 knots. So why does it have eyes and a beak? There are certainly intriguing features to this figurine. The fact that it can indeed fly (or can it?) suggests that its maker intended it to do so. But did the maker reproduce an aircraft rather than a bird? In favour of the former interpretation is the shape of the tail, as birds’ tails are horizontal. Against that interpretation is the decoration of the front end, which clearly depicts a falcon, with the characteristic markings shown on images of the falcon gods Ra‘ and Horus. The shape of the wings resembles paintings of Ra‘’s wings. It is only the tail that is wrong; perhaps that was deliberately altered to make a model that would fly. As pointed out by Larry Orcutt, it would function well as a weather vane and there are drawings of bird weather vanes on the masts of boats from the Temple of Khonsu at Karnak; they are depicted, significantly, with vertical tails. There are also problems about the account of the object’s discovery. I have been unable to find a trace of a French archaeologist called Lauret, although there was one called Victor Loret (1859-1946) who was Director of the Egyptian Antiquities Service and who conducted excavations at Saqqara in 1898, where he discovered the tomb of Khuit, a wife of the sixth-dynasty pharaoh Teti. I have found several individuals named Padiamun, but all seem to have lived during the Third Intermediate Period, up to eight hundred years earlier than this individual. Some online accounts claim that the figurine was found during excavations at the Step Pyramid (for instance, on this page, which seems to have been written by Dr Messiha’s son Dawoud), but this seems to be a misapprehension based on the fact that it is the best known monument of the necropolis. Furthermore, Dr Messiha was not a disinterested medical doctor, but a well known practitioner of radiesthesia (diagnosis by dowsing) and other ‘alternative’ medical techniques he claimed were practised in Bronze Age Egypt. In 1967, he carried out ‘psychic investigations’ in the Queen’s Chamber of the Great Pyramid where he claimed to have located an unknown chamber some 20 m below its floor by dowsing. He believed this to be the intact burial chamber of Khufu. Needless to say, no orthodox investigators have confirmed this ‘discovery’. 9 Responses to Egyptian ‘aeroplane’ models? Great anaylsis and I love your website. As a very breif belliever in Von Daneikens thesis when I was about 12 (before becoming a Sceptic) I well remember all of the rubbish he used to promulgate. When I was 13 or so my grandmother gave me a copy of “Some Trust In Chariots” by Barbara Theiring and that was the end of that! My believe is this is a representation of a bird caught in mid air. Birds like hawks, seagulls and so on, use their tails to manoeuvre, left to the right and back. Just observe them and you will see. The most curious thing about this model (if in fact it was discovered back then) was the shape of the tail. All birds have their tail shaped horizontally but the model has the tail shaped vertically. I’m just wondering about 1 thing, the model is made from wood. Won’t it have decayed already over thousands of years? not necessarily. There was plenty of wood in Tutankhamen’s tomb for example. The hot, dry air would preserve it. Im thinking it might have been broken at the tail as the tail was shaped for wall mounting. If it was a weather vane it would surely have an axle at its base somewhere. I agree. It does look like it could have been a toy. My first reaction when I saw it was “a toy bird”. If it is really a weather vane that could explain why the tail is vertical and not horizontal as in real birds. A weathercock is the most logic answer. Therefore by knowing the wind direction enable you to properly set your sail, the windmill, etc. Perhaps at higher altitude when building the pyramids (to direct on where to stand to not being pushed away by the wind) , the falcon weather vane was there to guide and protect the slaves building the pyramids .